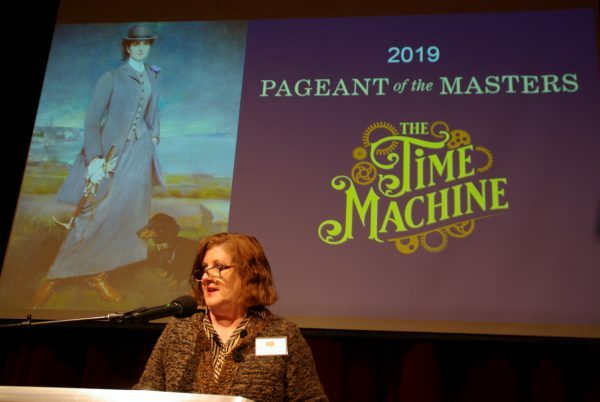 Pageant of the Masters Director Diane Challis Davy, who is entering into her 24th year with the show, announced the 2019 pageant theme at the Nov. 14 membership meeting. Taking its cues from science fiction and steampunk fantasies, pageant organizers said “The Time Machine” will transport audiences around the globe and into the past, present and future in search of great art and amazing stories. Each year, the pageant’s tableaux vivants—or living pictures—come to life thanks to the work of a dedicated team of artists, designers and volunteers. Challis Davy said the 2019 Pageant will provide the production team with a chance to showcase the technical mastery of the artists and designers. “They are the magicians who consistently create the special effects and awe-inspiring moments of theatrical wonder on the Pageant stage,” she said. “I’m hoping they’ll have a field day with ‘The Time Machine,’” scriptwriter Dan Duling added. 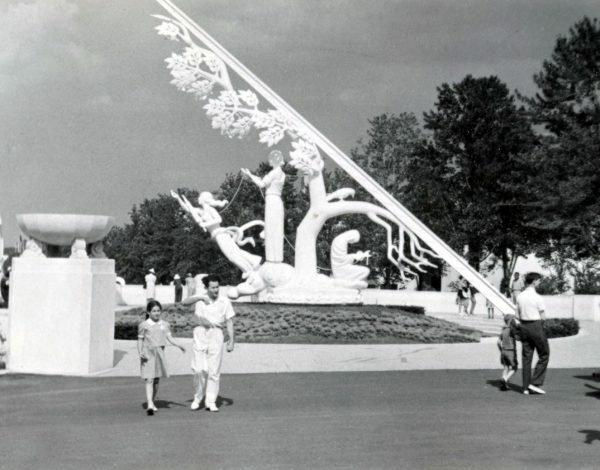 Time and the Fates of Man Sundial by Paul Manship is one of the artworks to be recreated in next year’s Pageant of the Masters. Photo courtesy of Pageant of the Masters. 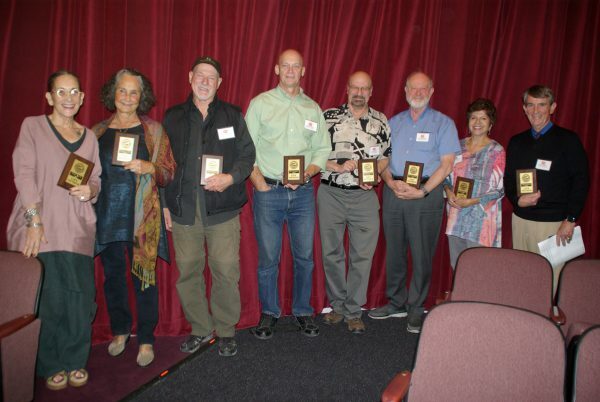 The membership meeting also included the presentation of awards for—15 years of service in casting: Rick Ruotolo and Kenneth Rutherfurd; Headpieces: John Connolly; Makeup: Ian “John” Begg, Wens-day Garcia, Sandy Geller, Jan Kennedy, Elvira Pimienta, Wendy Radin, Sallee Smith and Gary Sosenko. Other staff service awards included—Reagan Foy for 10 years as Costume Director; Michelle Riendl for 15 years as Accounting Assistant; Sharbie Higuchi for 20 years in Marketing, Public Relations and Merchandising; and Caryn Werfelmann for 25 years as Guest Services Director. Kollenda went on to say that many of the former scholarship recipients have established successful careers in the arts. Some of those include actress Erika Schindele, fashion and furniture designer Seena Shahmardi, photographer Sarah Elliot, and the pageant’s own Challis Davy. “Their achievements remain a source of pride for the scholarship program,” Kollenda said. 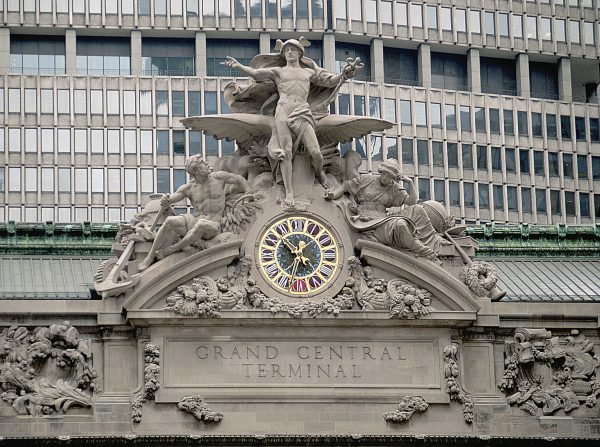 Transportation, the Grand Central Terminal clock by Jules Alexis Coutan, is one of the artworks to be recreated in next year’s Pageant of the Masters. Photo courtesy of Pageant of the Masters. Kollenda noted that for the 2018-2019 academic year, $87,400 was awarded in scholarships. That included 17 awards to first-year college-bound students in the amount of $29,800, with two in dance, six in music, one in theater, seven in visual arts, and one in writing. The students have an average high school GPA of 3.56. In addition, scholarships were awarded to 31 former scholarship recipients. “We follow the students for four years, and if they do well, they are awarded a scholarship each year,” Kollenda concluded. Also during the meeting, Julie Kirchen, with Disney VoluntEARS, presented board president David Perry with a check for $5,000. “Another amazing year is ahead for the 2019 Pageant of the Masters in Laguna Beach; it will be a step back in time with ‘The Time Machine,’” Perry said. Pageant of the Masters volunteers were presented awards for their long-time service during the Nov. 14 membership meeting. Photo by Loreen Berlin. When: July 7—Aug. 31, nightly at 8:30 p.m.
Volunteer tryouts for the pageant are Friday, Jan. 4, from 7-9 p.m., and Saturday, Jan. 5, from 2-5 p.m.